Isn’t it interesting how some of us are wired? Take siblings, for example. One sister can happily live in a messy, dirty house and think nothing of it– including stained carpets, dust balls the size of small animals, spider webs, and strange things growing where they shouldn’t… while the other sister will literally wipe the table every time you take a bite of food, to ensure no crumbs find their way to the floor! Nothing annoys a neat/clean freak more than seeing a stain in their carpet. Ugh. Their otherwise perfect carpet is ruined! 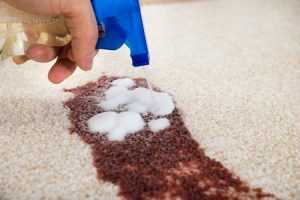 Oh, the agony of seeing stains like vomit, urine, wine, or blood on otherwise “nice” carpeting… but what to do about rough stains? If and when you’re around a carpet where a stain starts to occur, catch it quick. If there’s a lot of debris involved, use a fork, spoon or other utensil to remove as much as you can, quickly and gently. Basically, avoid pressing “stuff” into a carpet. Next, grab a damp paper towel and press into the stain, over and over, for a couple minutes. You’re essentially loosening up that stain. After a couple minutes, find and use a stain-remover cleaning product on the “spot.” Follow the directions, and afterward you’ll want to rinse the spot with cool (not warm) water, dabbing it dry. This is basic stain clean-up/prevention. What about the roughest stains? What about red wine on a white carpet? For the rough stains, you’ll probably have to resort to using carpet stain remover, a product you get at the store in bottle form for about $5. Look for ones labelled “pet stain remover,” as they tend to do the job well. After applying carpet stain remover, you’ll wait a couple minutes, and then tend to blot the spot with a damp paper towel using cool/cold water. You might have to repeat this several times– the more stubborn the stain, the more dabbing you’ll need to do. If you have the time, money and inclination, you can use carpet cleaning appliances on rough stains. Hoover’s “SmartWash” is a powerful tool to remove stains from the carpet. You can also try the Bissell “PowerLifter PowerBrush.” Meanwhile, steam cleaners and “wet vacuums” are also known for cleaning carpets. Finally, if you’re dealing with stains that smell bad, try incorporating vinegar and baking soda into the cleaning mix in order to take the stink away. If you’re looking for discounted carpeting from premium brands in the Phoenix, AZ area, stop by Carpet Closeouts today.